There is something called the shock of the mundane. In the never-ending flood of poor histories, inadequate novels and confused websites that proclaim Countess Erzsébet Báthory to be the greatest serial killer of all time, there has come a certain tawdriness to the topic: incomplete psychological profiles, unsatisfactory histories, repeated thriller legends, and a distinct lack of truth. With Infamous Lady: The True Story of Countess Erzsébet Báthory, Kimberly Craft stripped down those stories to basic facts. 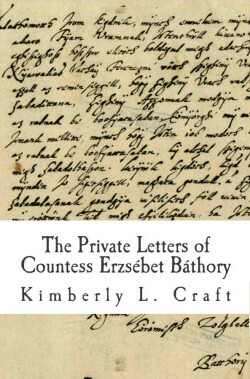 Kimberly Craft's latest book, The Private Letters of Countess Erzsébet Báthory, rips another hole in the fictional cloth about the "Blood Countess". Craft has gone where no author has gone before: directly to the Countess Báthory's letters. And they are shocking ... because they are, in their formality and in their attention to detail, stunningly mundane. Let me back up. Craft has collected about 40 letters "written by or on behalf of" the Countess. These supplement the material already published in Infamous Lady, so the two books can be considered complementary. Craft explains where the letters were found -- nothing mysterious here; they came from archives -- and the struggle of translating documents handwritten in old Hungarian with its difficult orthography. She is careful (as one would expect from an attorney and legal historian) and provides alternate translations of problematic words as well as context, notes on meaning, and explanations of the various handwriting (likely via scribes) found in some of the letters. Craft also puts the letters into historical, political, social and religious context. Indeed, without that context, the letters hold little information for the reader. First offered is a biography of Countess Báthory, one that should replace the dilapidated histories found on most websites. This biographical chapter, as with the entire volume, is written in Craft's efficient and prosaic style, and suffers little of the inconsistency of Infamous Lady. Where it does become inconsistent, in fact, is in the very description of the killings of servants. They seem an afterthought or an insertion, as if Craft had to contextualize the ordinariness of the Countess's quotidien activities with the killings of which she was accused and for which she was ultimately imprisoned. Nevertheless, they are important for those searching to place the criminal Erzsébet with the Erzsébet who managed castles, lands, and wealth. Following the biography is a brief look at the life and times of 16th century Eastern Europe, including the 1514 Opus Tripartitum, which created serfs of all the peasantry as punishment for György Dósza's failed rebellion against the ruling nobility -- a system of serfdom that would stay in place until the mid-19th century. Craft describes the wars, the political divisions, the rise of Rudolf as Holy Roman Emperor, and the inflation that endangered the Vienna-centric West. Writes Craft, "It is against this challenging backdrop that we now examine some of Countess Báthory's earliest known letters." And then we are invited to dive into the Báthory writings ... about the household. Yes, the household. We learn how letters were folded and sealed, who officiated for whom, and that the Couness asked to "get our price or the numbers on the twin calves that are available today. You may use cash for this or not." Twin calves? This from the Blood Countess? It goes on. Craft describes the measures of wheat (a stone, 12-14 pounds), who is sold it, who is given it, when and how it is to be delivered. There are letters about pygmy cattle and purloined cannabis, the reproportioning of cheaper crops, and the need for crayfish. Craft herself marvels over this detail, writing "she concerned herself with even the smallest transactions, directing something as trivial as the purchase of onion wreaths!" By the time Countess Báthory has reached her thirties, she takes into confidence Ferenc Batthyány, a compatriot of her husband.These letters are no longer about minor household matters, but issues closer to the management of lands, of politics, and of the swirling allegiances that afflicted a region both under attack from the Turks to the east and victim to internal royal, religious and ethnic rivalries. This correspondence is longer (albeit one-sided, as Craft could not turn up the responses from any archives) and gives insight into Báthory's intelligence, sense of allegiance, and motherhood. And it is here that the story begins to turn -- with Erzsébet running short on cash (land and castles were not liquid assets) and being Protestant under an increasingly Roman Catholic vigilance, she needed to negotiate carefully and navigate the treacherous political waters. These already swollen waters were roiled further by an uprising led by István Bocskai. It is in this chapter that Craft's powers of narration come into force, tightly identifying the conflicting forces that brought the Countess into grave danger. Yet she was still tending to her administrative duties, and Craft makes an interesting discovery: Lady Báthory intercedes for a woman and her daughter in a way that brings into question the very concept of the cruelties of which she was accused. With villages burning, peasants being slaughtered and properties being confiscated, the Blood Countess included those peasants in her attention. Indeed, the chapter "Letters from the Bocskai Uprising" is the most powerful and disturbing chapter of The Private Letters of Countess Erzsébet Báthory. We are brought quickly to the end: the Countess dies, her cousin Gábor dies, Thurzó dies, King Mátyás dies and, at long last, her confidant Battyány dies. The book concludes with two letters by the Countess's husband Ferenc Nádasdy, and Craft leaves it there. In The Private Letters of Countess Erzsébet Báthory, Craft is no Melville. Her tone is unhurried but clear and terse. The book could certainly do with an index; its absence is felt. Yet Kimberly Craft has just the right feel here, not interposing herself except as a kind of reader's amanuensis. The simplicity of Craft's and the convolution of Báthory's prose reveal that, indeed, the Blood Countess attending to both treaties and twin cattle is the shock of the mundane.